On February 12, a new single by by Kurt Larson (Information Society) and Eric Gottesman (myself, of Everything Goes Cold and a frequent contributor to other industrial bands) called “Deniers” will be released exclusively on Bandcamp. 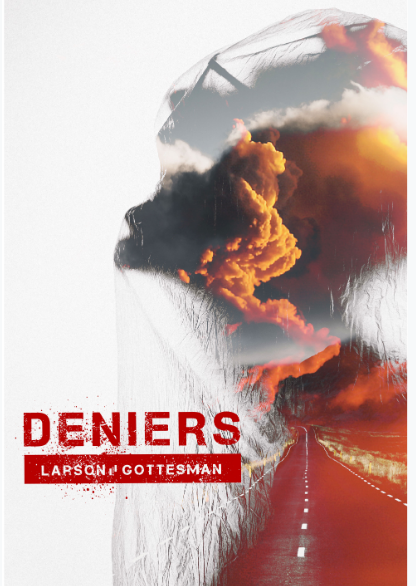 “Deniers” is a new single by Larson/Gottesman, a collaboration between Information Society’s Kurt Larson and Eric Gottesman of Everything Goes Cold. The track was composed over four years between both artists’ other work, and incorporates elements of Larson’s classic synthpop character and Gottesman’s chiptune-infused industrial rock. The single also features remixes by New Mexico synth-rock band FIRES and the Toronto new wave outfit Glass Apple Bonzai. The song’s lyrics are a harsh rebuke of climate change denial, a particular point of acrimony for Larson. The duo intends for the single to draw further attention to the issue, particularly from other artists in the hopes of spurring the creation of more music on the theme.